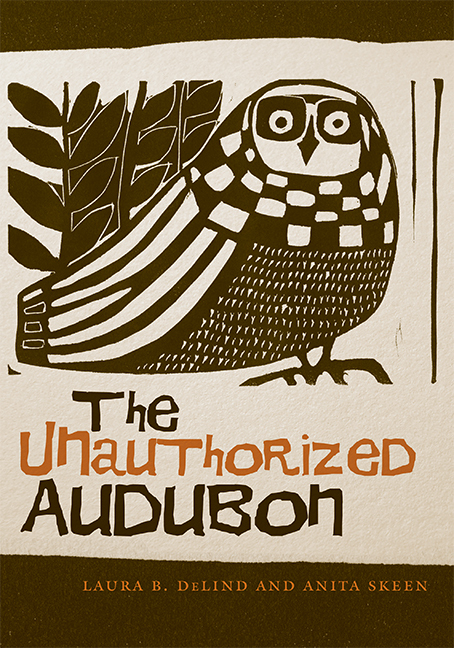 In an age of experts and individualism, metrics and competition, The Unauthorized Audubon is something of an anachronism. In fact, its creators, printmaker Laura B. DeLind and poet Anita Skeen, never set out to produce a book at all when they began exchanging prints and poems, but something happened along the way. As they began to appreciate at a deeper level the skill involved in each other’s work, they began to find meaning in small things—a pattern, a memory, a carefully chosen word. In his essay “Plugging into Essential Sources,” Eric Booth introduces the concept of “response-ability.” He describes it as the capacity to connect with the artful work of another. It represents both our need and our promise to respond in an open, eager, and multi-sensual way to a world of possibility. Without this capacity we are crippled in our ability to imagine and to grow. This book is all about response-ability as experienced by the two artists and the visitors to an exhibit of their work at the Michigan State University Museum. This concept and activity animates the twenty-two bird-like spirits found herein, reminding us that there are other such spirits hovering expectantly just beyond the pages, simply waiting for the imagining. Laura B. DeLind is retired from the Department of Anthropology and the Residential College in the Arts and Humanities at Michigan State University. "Poetry and relief print-making are different artistic media. They use different tools. They appeal to different senses. They attract different audiences. Yet bringing these two creative forms together has expanded our ability to appreciate them both. We have found that despite their differences, poetry and print-making share much in common. Line and mass are critical elements for establishing the sound and structure of a poem. They are just as central to the composition and balance of a print. Repetition and high contrast are design principles often used to create a sense of power or conflict in a print. They are equally meaningful when used to create focus or tension within a poem. Likewise, metaphors – giving familiar ideas altered contexts and relationships – allow both poetry and print-making to challenge the world as we know it and to move us into new places of reflection and discovery.